The gossip surrounding the film might be a better film story than the film itself. It was directed by Bryan Singer (“X-men” films) and although he called it a passion project, his breakdown on the set caused him to be fired towards the end, and stripped of his producer tag. That may explain the sketchy and soft “band story” that dominates the film, and some of the rock movie clichés that permeate at strange times… the concert montage could have been from the 1950s. 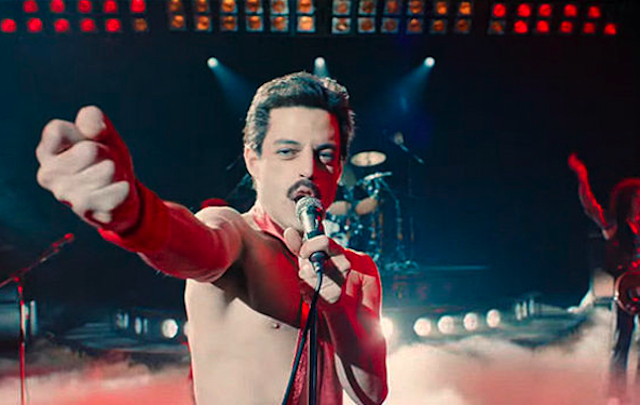 But, Rami Malek (“Mr Robot”) is career-defining as Freddie Mercury, lead singer of Queen and ultimate tragic rock god (Mercury passed away from AIDS in 1991), plus the film has the “Killer Queen” music and celebration of a dominate force in the pop/rock of the 1970s and ‘80s. Get on this Mystery Trip. In the early 1970s in post-hippie London, an outsider 24-year-old immigrant from Zanzibar named Farrokh Busara met a band named “Smile.” They re-emerged with Busara as a new lead singer, renamed Freddie Mercury (Rami Malek), and a new band name Queen… with guitarist Brian May (Gwilym Lee), drummer Roger Taylor (Ben Hardy) and bassist John Deacon (Joe Mazzello). Armed with a knack for writing and performing catchy pop/rock music, the band cut a swath through the 1970s with their hit songs, which included their epic six minute opera, “Bohemian Rhapsody,” which EMI record exec Ray Foster (Mike Myers) called “unplayable” for the radio of the time. The ups and the downs followed, culminating in their greatest show ever, the 1985 Live Aid performance.